Email allows you to consistently reach people over time – in their inbox! It is one of the most effective, yet underused, components of digital marketing! 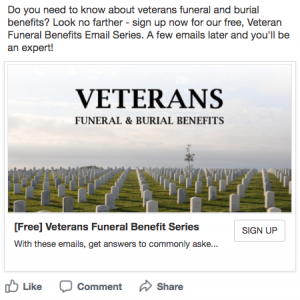 When you work with Funeral Innovations we will create and manage your email marketing strategy including personalized next-of-kin emails, email campaigns, and newsletters. And, as a Growth Engine customer we do it all for you. 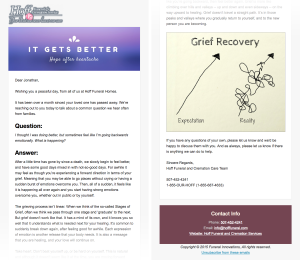 Aftercare Email Series: When you serve a family – you simply add the next of kins’ email address(es) and date of loss to the system. Over the next year they will automatically receive relevant emails that are timed based on the date they lost their loved one. Emails with helpful guides for grief, warm wishes, handling financial and legal issues after death, the holidays, anniversaries and general “thinking of you” messages will be sent to them, from you, automatically at times when they need support the most. Email Campaigns: Funeral Innovations will create and send ongoing email campaigns to nurture your subscribers and stay top of mind. These emails will often tie into other campaigns we manage for you that include landing pages and social media. An example campaign guides people through having a conversation with their family about their death wishes. “The Second Most Awkward Conversation You Will Have With Your Parents” campaign has a fun headline that encourages people to read the valuable how-to guide that may lead them back to you when they are ready and need your services. 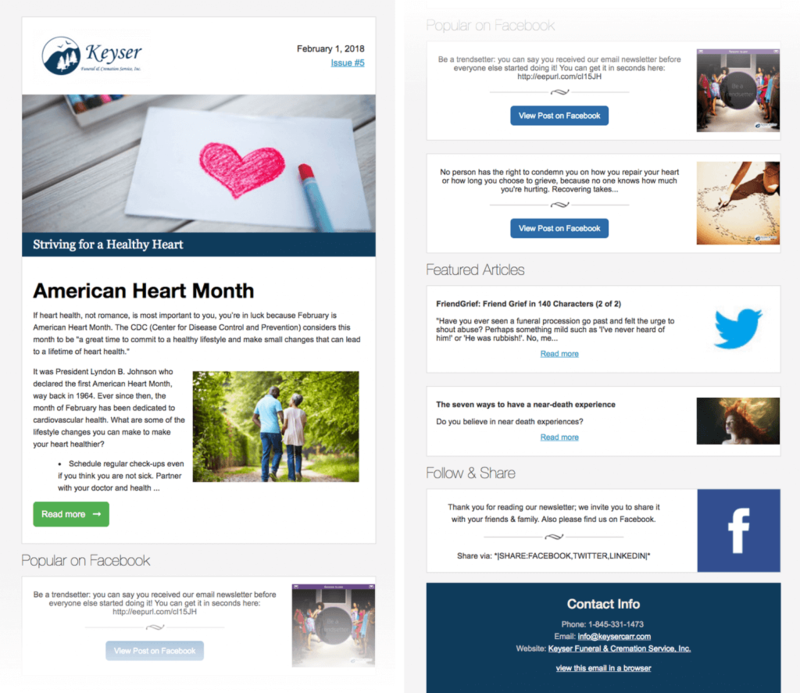 Newsletters: These are a popular form of email marketing that consists of sending monthly informational updates to your list of subscribers – maintaining top-of-mind awareness and building a community around your brand. You can use newsletters to announce a new service, promote your events, generate business and go more in depth into a particular topic than you can in other mediums, like social media. We create newsletters that educate your audience and build credibility around your company – for you. Never write another email! We provide a massive content library of original, exclusive articles and attachments, containing all the email content you’ll ever need. When added to your subscription it is a valuable tool allowing you to send large volumes of emails to your community easily and affordably. You will have your readers’ full attention right in their inbox! And they will appreciate the valuable information you provide. We measure and report your email results to you in order to iterate and improve. Over time, your emails will become more and more effective!